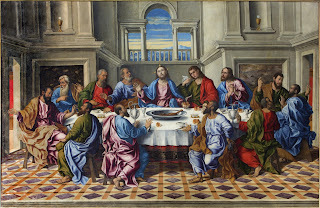 Most paintings of the Last Supper show the Apostles shifting restlessly--just like our children at Mass! How long is your child’s attention span? Most research suggests that children’s attention spans relate to their age: how many years old are they? That’s the same number of minutes they can sustain interest in an activity. Four-year-old children, for example, can pay attention for four minutes. Some studies claim attention spans extend up to two times the child’s age. In that case, under the right circumstances, our 4-year-old children can accomplish eight minutes of acceptable church behavior. Depending on your parish, the eucharistic prayer occurs about 40 minutes into the celebration of Mass. Forty minutes of liturgy is FIVE TIMES those eight minutes we can expect from our little ones. And some of our children struggle with medical or behavioral challenges that make the basic eight-minute mark a miracle. Read the rest at Praying with Grace!